SanTan Village © Westcor, used with permission. SanTan Village is located in Gilbert, Arizona at the intersection of Williams Field Road and the Loop 202 Santan Freeway. Here is a map with directions. There are more than 100 stores at SanTan Village (there's no space between San and Tan in the name of this shopping area). It covers quite a large area, and you might need to move your car to get to all the stores that you want to visit. Chico’s, White House/Black Market, Ann Taylor, Disney Store, Swarovski Crystals, Coach, Aeropostale, Fossil, Apple Store, Jos. A. Bank. 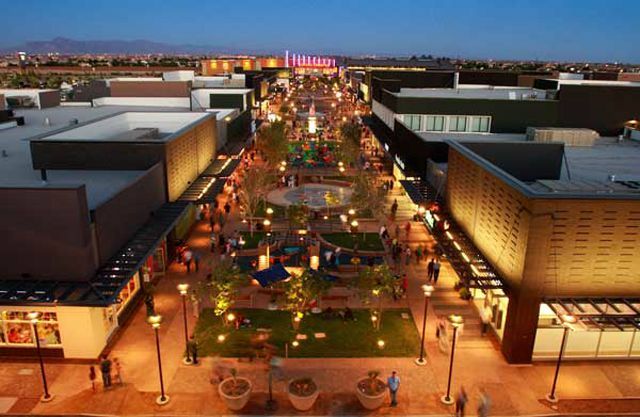 SanTan Village is described as the first super-regional shopping center in Arizona to combine department and specialty stores, a major cinema, an indoor food court, office and residential offerings in an open-air streetscape environment. There is a children's play area and a pop jet water fountain where kids can have some wet fun. It is located near Dillard's. That phone number is 480-792-1500. Harkins SanTan Village 16 is on the northeast side of the mall. You can see photos of SanTan Village in the Shopping Mall photo gallery. Stores and restaurants open and close, and mall programs and other features change from time to time. If you have specific questions about the mall, visit SanTan Village online or call them at 480-282-9500.